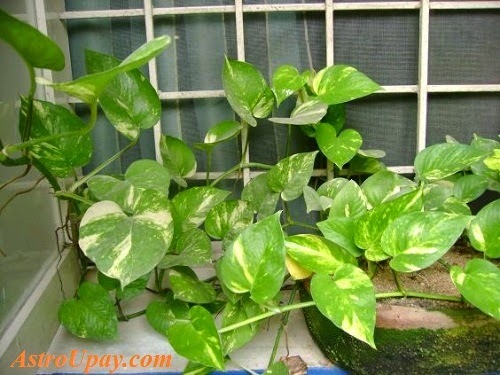 Check the benefits of Planting Money Plant in your house, Precautions and situations to avoid and to take while planting money plant. Read More About Money Plant in Astro Upay's Today Dose. There is a belief that one who has a money plant they have not only wealth increase but also their income will also increase. That is why some people plant money plant in their home. Due to plant money plant at home wealth as well as income increase. That is people plant it in their home. Money plant is the plant which can be found in Southeast Asia (Malaysia, Indonesia). Their leafs always remain green. They will increase one by one and their shape is like heart. You can find cactus, bonsai, which expense are less, to plant in your home however due to good growth money plant increase the interior decoration which cannot be get by any other plant. Money plant can be plant anywhere in the home. Also you can also plant it in water. You do not have to take care of it too much. You can keep it inside or outside of the home. Your eyes go on this plant where it keeps. You can also cut their leafs and make it more attractive. The owner of the Southeast direction is Lord Ganesh and representative is Venus. That is why they prefer money plant on this direction. Ganesh removes bad luck while Venus increase the wealth. The cause of vine and creeper is Venus. That is why money plant should be plant in Southeast direction. Do not plant money plant on Ishan means northeast direction. Because it is considered as negative side of it. The owner of this direction is Jupiter. And the relation between Venus and Jupiter is enemy. You may get loss if you keep in Ishan direction. However you can plant Tulsi on this direction. You can keep money plant in pot or bottle filing water in it. By doing this you can attract the positive energy which increase the wealth.